EconEdLink - How Will I Pay for College? In this lesson, students will learn about current trends in student borrowing and determine a reasonable debt load for hypothetical students. College costs have escalated over the past two decades, and more and more students are relying on student loans to cover the costs. Therefore, it is more important than ever to carefully consider the costs of college, your anticipated career income, and how to best finance those college expenses. According to the Federal Reserve Bank of New York, student loan debt has tripled between 2004 and 2014, and the average amount of debt per borrower in 2014 was $27,000. Most students do not understand the long-term implications of taking on large amounts of student debt and have no idea what their monthly loan payments will be after graduation. Despite the high costs, for most students, it still pays to attend college. However, students need to carefully consider the options for financing their education before utilizing student loans. In this lesson, students will analyze the student loan decisions of hypothetical students, consider ways to reduce the amount to borrow, and examine data to determine wise choices for their own anticipated student loan debt. We would like to acknowledge the Outreach and Education staff of the Federal Reserve Bank of New York for their contributions to this lesson. 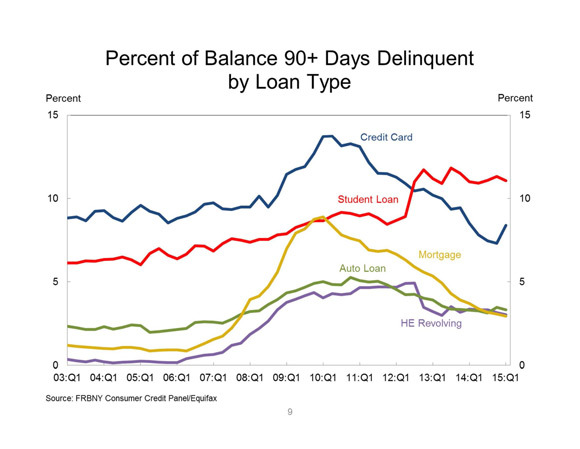 Analyze trends in student borrowing. Identify the costs and benefits of taking out student loans. Identify ways to lower the cost of attending college. Use online calculators to determine the amount borrowed and monthly payments, and to compare the impacts of changing the amount borrowed. 1. Put the students in small groups of three to five. Students will take the Student Debt Quiz, discussing each question before answering as a group. Encourage students to discuss examples of friends and family members to help guide their answers. After students have had 5-10 minutes to work on the quiz, go over the answers. True or false: Student loan debt can be discharged in bankruptcy . True or false: You don’t have to repay your student loans if you don’t graduate. True or false: You don’t start paying interest on your loans until after you graduate. What is the percentage of 25-year-olds who hold student debt? True or false: Students who owe less than $5,000 in student debt have higher default rates. 2. In the Hidden Costs of College lesson, students calculated the cost of attendance for two different schools and realized that they may need to take out student loans to cover part or all of their college expenses. In recent years, student loan debt has significantly increased, so it is very important for students to consider not only the cost of college, but the income they can expect to earn in their career after college. If students intend to enter a career which pays a lower income than others, they will need to determine whether borrowing large sums of money to attend their dream college is appropriate. 4. Tell students that a good rule of thumb is to avoid taking on more debt than they expect to earn in their first year of work. Also, discuss the opportunity cost of these loan payments–what students may have to "give up" in order to make loan payments. Students with significant debt may find that they don't have enough money for a new car or a down payment on a house. Armed with their background knowledge about student debt, students will read case studies of hypothetical students and advise them regarding a manageable amount of money to borrow. For the first two case studies, have students use one of the following websites to find the salaries the students in the case studies can expect to earn: http://www.bls.gov/oes/current/oes_nat.htm or http://www.careeronestop.org/toolkit/toolkit.aspx . Have students divide annual income by 12 to determine monthly gross income. Click "Add Loan," select "Direct Unsubsidized Loan," and type in the amount to be borrowed. Use 4.29% as the interest rate. This is the interest rate for unsubsidized federal student loans initiated in 2015-2016. Use the Standard Rate as the monthly repayment cost. Have students compare the monthly income to the monthly student loan repayment. How would the students advise each student in the case studies? 5. Discuss with students ways they can reduce college costs, reducing their reliance on student loans. At a time when college costs are higher than ever, it is important to carefully consider the level of student debt a student should carry. It is critical for students to plan in advance, find ways to reduce their college costs, and be realistic in selecting a college with costs the student will be able to afford to repay. Given concerns about the size of student loan debt, is a college education worth it? Absolutely. Even though costs have escalated in the past decade, a college degree is still a worthwhile investment for most students. On average, college graduates earn significantly more income than non-graduates, and they are less likely to become unemployed. A study by the Federal Reserve Bank of New York found that the return on investment in a college education (calculating the costs and benefits of a bachelor’s degree) is approximately 15% – more than double the 7% historical rate of return in the stock market! Of course, not all degrees are equal. Engineers saw a 21% return on investment, while teachers only saw a 9% return on investment. But given the trends of falling wages for those with high school diplomas, compared to stagnant wages for those with a college degree, the benefits of a college degree still outweigh the costs of that degree. To calculate the age at which a college degree will begin to pay off, visit: http://www.frbsf.org/education/teacher-resources/value-of-college . To see an infographic about college benefits and costs, visit: https://www.stlouisfed.org/education_resources/college101/index.html . The videos on this website can be useful in supporting the infographic. Your choice of college and career are among the most important decisions you will ever make. Take the time to do careful research and prepare to reduce your costs, so you can enter a career with minimal debt and make those investments and choices of your dreams! Students can work with their parents to calculate the estimated net price of attending college. The College Board Net Price Calculator at http://studentnpc.collegeboard.org/ bases the estimates on parents’ financial records, test scores, and GPA. Please note that not all schools participate in the Net Price Calculator. In the Net Price Calculator, click on "Participating Schools" and then select a school and "Enter as a Guest" to get started. Let’s bring this close to home. Have students use the salary indicator to determine their likely salary in the career they are considering: http://www.bls.gov/oes/current/oes_nat.htm or http://www.careeronestop.org/toolkit/toolkit.aspx . Next find the estimated annual cost of attendance for the college the student would like to attend. Visit the college’s website or go to http://nces.ed.gov/collegenavigator to look up tuition and fees. Students should multiply that annual cost by the number of years they expect to be in college. Although the costs of graduate school tend to be significantly higher than for a four-year degree, for purposes of this lesson, students should just use the same tuition for additional years of graduate school. Given the monthly student loan repayment and projected salary, is this college a smart financial choice? Explain why or why not. Explain three specific actions the student could take to reduce the amount of student loans required to finish the college education.